Kids, Cows and Grass: How did you celebrate Independence Day? 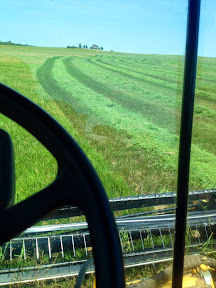 I spent most of the July 4th holiday in the hay field. But that's okay because the weather was perfect and it was a beautiful day! We have had cooler temperatures in Kansas and lots of rain but this cool season grass didn't get the benefit from this weather. It was already mature by the time the rains hit. So the yield from this hay crop is terrible! 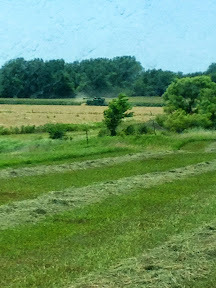 This field usually makes enough hay to feed our cows for the majority of the winter. Absolutely NOT this year! But the rains have been helping the warm season native grass, so there is plenty of grass in the pastures! We will be able to keep cows out in the pasture later, possibly long enough to make up for the deficit in hay. 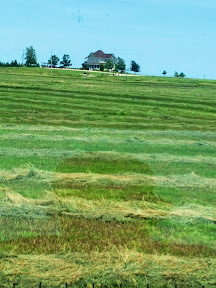 I love this field--it is right in front of our house! It is around 200 acres (an acre is the size of a football field!) and has been planted to brome grass for many years. 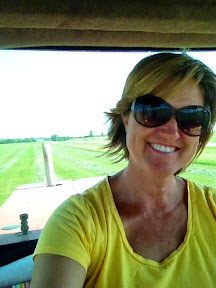 I rarely have any trouble in this field--meaning I don't have to stop for anything and I don't have to even get out of the tractor to fix anything. So I wear my flip flops! Just my little streak of independence! There is my neighbor harvesting wheat in the next field over! Lots of farmers were working this holiday season! 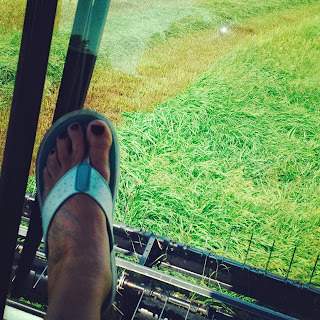 We spent Fourth of July in the hay field. Dry and cool till June then all June it rained. Still cutting ruts in the hay field in places. Getting some haying weather now. Sweet clover is big in places so really putting up the bales. Our son bales and he has had two different days of baling over a hundred bales. Just found your blog I think I will enjoy it. Thanks for finding me & my blog, Dallis! Glad to hear you are getting good hay! We spent the 4th in the wheat fields. We feel blessed to be having a fair to decent harvest after the drought. God bless. I agree! Our wheat harvest was pretty variable. Some fields were terrible, but some were surprisingly good. You just never know. I hope you had a big batch of fried chicken to celebrate!! What a perfect all-American meal!